I don't know what it is about Draft Horse Classic, but it seems to be an unlucky time of year for me. Last year was worse in that respect (dead car battery and flat tire in same day, hour late for show, long story!). 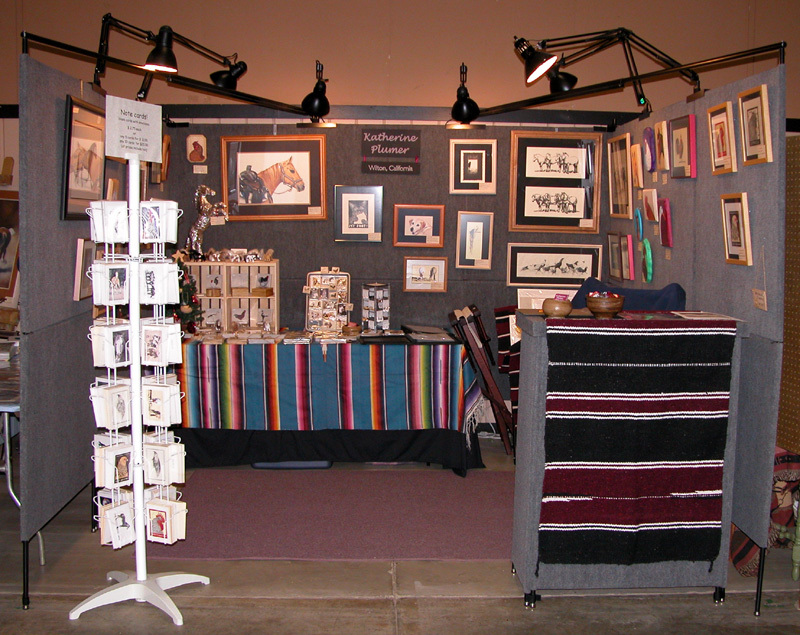 I finished loading up Mom's minivan late Tuesday night, and left here Wednesday morning to set up for the show. It took me about 4 hours to set up, working alone, which isn't too bad. I'd been really smart this time and made a "map" in InDesign so I knew ahead of time exactly where to hang all the framed stuff. That was a major time-saver, and meant I didn't have to spend as much time standing around thinking "hmmm" and wondering how to fit all the stuff on the walls. Wednesday night I packed up all the clothing and food I would need to last until Sunday, since the plan was I would stay in a motel with my friend R (fellow artist) rather than doing the 75 mile commute twice a day like I have done in the past. As I drove up to Grass Valley Thursday morning, I just kept thinking "I am soooo glad I don't have to do this drive twice a day!" So I got up there and had everything all set up, and wandered over to R's booth to say hello (she got there after I did on Wednesday). She made some comment about the campground not being all that bad. Huh??? I had no idea what she was talking about, but decided maybe she was camping for one night since I hadn't wanted to stay in town Wednesday. I halfway jokingly asked if we were still roommates for the next few days, and her jaw kinda dropped and she said "you didn't get the email?" Nope, hadn't gotten the email a few weeks ago that told me she cancelled the room and was going to camp instead. Crap-o. Not that commuting is such a big deal, I've done it every other year, it was just a bit of a shock to find out at the last minute. Oh well, I stewed over it for a while but decided it wasn't the end of the world. After hearing my sob story, S (another artist) offered to let me stay with her and her husband. I thought that beat the heck out of driving home again, so I said yes. After all, I had everything I needed to last through the weekend, and it meant I could stick around to watch the horse show that evening. So at the end of the art show that day I went out to the car to grab some dinner out of the big cooler I had packed with about a million blue ice thingys. Apparently I should have used more though...ALL my food was warm. Gross! Thoughts of food poisoning filled my head. Hmm, no, that would be a bad way to spend the next couple days. Crap! So then I thought well, that's ok, I could just go to the grocery store and restock (I can't leave my booth to go outside to eat during the day, since I am there alone, I'm pretty much stuck). But Thursday had been so pathetic I didn't even have enough $ to do that, so I decided it made more sense just to drive back home and mooch. So I did. Friday was marginally better than Thursday, and that night I stayed with my brother and sis-in-law in Sacramento, which definitely shaved off some mileage. (thanks you guys!) Saturday and Sunday went better in the transaction department, though over all off the top of my head I would say this is the worst I have done at that show in the 4 years I've had a booth there (4 years! time flies!) Attendance seemed lower, spending was definitely lower. The number of things sold was way down for me, and once again it was the little things like note cards that pulled me through the show. Thank goodness for note cards. I did sell one framed original lithograph though ("My Foot" print #4) which was very cool. Anyway, I think there are just too many economical problems right now, and people aren't inclined to buy art when they can't afford to buy gas, etc. Hopefully next year will be better! Yes, I plan to go again. Now I have tons of unpacking and cleaning to do, and as you may have guessed, cleaning (especially when nagged about it, ARG! #$*&%$@!) is one of my least favorite things to do. Oh, I should mention I got an Honorable Mention in the show with "Dreadlocks and Dust" (Friesian, stone lithograph). I would be very curious to really know how everyone did there. What is "doing badly" to some people might be "doing really well" to others. It seemed to be a mixed reaction. Some people did really well, others didn't. What that means though seems to be an individual thing. But there are good things here too, even though the show didn't exactly make me rich. ;-) I love being around a bunch of like-minded artists. I have a reputation now, they call me "The Chicken Lady." I'm cool with that. :-) It's good to be known for something, and that works for me. Visitors remember me from year to year, lots of repeat customers. They tell me the love the variety of things that I do (it's not a booth full of things that all look pretty much the same). They love the chickens. Once again the chicken stuff outsold the horse stuff. It's the chickens that bring people in. They stand out front and comment on the roosters, then they come in and look around. It's so inspiring being around a bunch of artists, and seeing what everyone else is working on. There are some incredibly famous people there. I am not going to name-drop, but if you are into western/equine art, there are names you will most definitely know. I can't even begin to tell you what an honor it is just to be showing in the same room with these artists. And that they know who I am, and have given me so much positive feedback on my work, it just totally thrills me. These are people whose work I have admired for years and years, and here I am on a first-name basis! I know that must sound incredibly dorky, but it's such a thrill to be a part of that world.